Baby Maruti Mukhni of Molgaon village in Maharashtra’s Karjat district may be illiterate but she is a fighter and no farm house owner can dupe her of her dues. She has managed to reclaim the Rs 1.40,000 from two farm houses owners she worked for and is fighting for wages from yet another farm house owner. 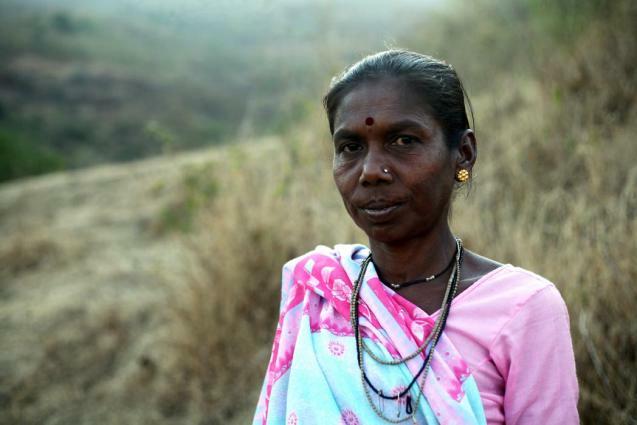 Maruti and her family looked after a farm house and for the first three years she was paid regularly. Then for eight years the owner was irregular in his visits to his farm house and she got no wages. She asked the Sangatana to help her and even travelled to the farm owner’s house in Mumbai to demand payment for her work. The owner said he had suffered financial losses and was unable to pay her. But when he sold the farm house, the new owner paid her Rs 40,000 and she continued looking after the farm house. The farm house was sold again without her knowledge and when she demanded her wages of the new owner, he said she was working on his farm house without his consent and filed a complaint with the police. She went with the Sangatana to the police station and the owner settled the case paying her Rs. 1 lakh. Another farm house owner who she worked with for 18 years did not pay her a paise because she was living in his outhouse and growing vegetables on his land. She has complained of non-payment at the labour courts in Panvel and has been five times to the courts. Maruti has been able to fight for her rights and her wages because she is an empowered woman and has the backing of the Sangatana.